Have you ever used a steam mop before? Those are really effective devices when it comes to ensuring that all those nasty, unseen bacteria get mopped up for good, in addition to having your floor feel nice and clean along the way. 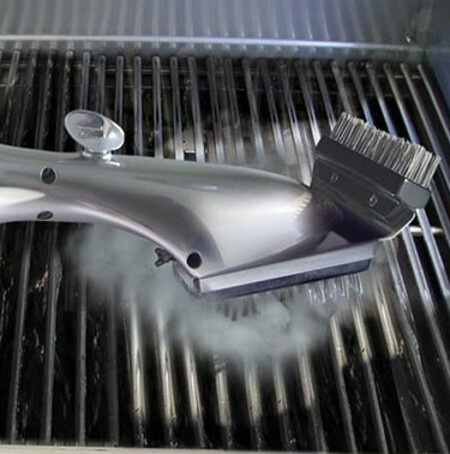 Well, here is an idea – how about miniaturizing the steam mop into something that will help you clean those hard to reach grill grates? This is where the $69.99 Steam Cleaning Grill Brush comes in handy, where the device itself sports a chamber within the handle that can hold up to a couple of cups of water within to get some hot and steamy action going on in no time at all. This grill brush will also carry a spout that is set within the bristles to release water onto hot grill grates, resulting in the ability to create steam which subsequently, removes burnt-on food and grease without requiring you to break a sweat. The steam itself is capable of loosening even the most stubborn of stains, enabling the two heads of rigid, double-gauge stainless steel bristles to quickly clean the grates. The frame itself is made from durable alloy aluminum, where it measures 18.25″ in length so that you can reach all areas of the grill while enjoying optimal leverage. This looks like a great gadget. Unfortunately I live in the UK and I bet you can’t get them her – just not enough warm days to have BBQs.